Amarillo Rifle and Pistol Club hosts NRA-sanctioned conventional indoor and outdoor pistol matches on our twelve-position 25-yard indoor range or our 26-position 50-yard outdoor facility. The NRA classification system will be used and all scores are reported to the NRA. Indoor matches are 2-gun 1800-point conventional matches with 22 rimfire and centerfire divisions. Lead bullets only; jacketed (hardball), plated or polymer coated centerfire bullets cannot be used in the Indoor Range. Outdoor events may be either 1800 point matches or 2700-point events with a hardball division. NRA Matches are open to anyone. Texas State matches require membership in TSRA but a duration-of-the-match TSRA membership is available for a fee for non-Texas residents. Check the club calendar for match dates and times. 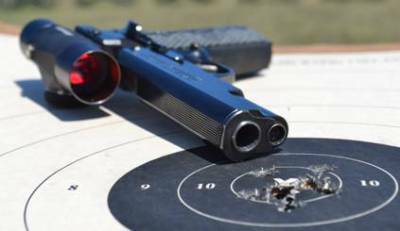 Program information for our league matches and major events are posted on their respective Pistol Match web pages. For additional information concerning Amarillo Rifle and Pistol Club Conventional NRA pistol Matches, contact the Bullseye Tournament Match Director listed on the Contact Information web page.